While the Obama administration and their mainstream surrogates maintain that the economy is growing at a booming pace, the reality of the situation is starkly different. According to a report from the Bureau of Labor Statistics some 94.6 million Americans (age 16 and over) are either not working or have made no effort to find a job. With a population of 320 million, that means nearly one in three people in the United States are currently out of work. Curiously, the official unemployment rate remained unchanged at 5.1%, suggesting that some 95% of people actually have jobs. But as we’ve repeatedly pointed out, that number has been completely skewed over the last two decades as it fails to account for people who have stopped looking for work (because there are no actual jobs available). 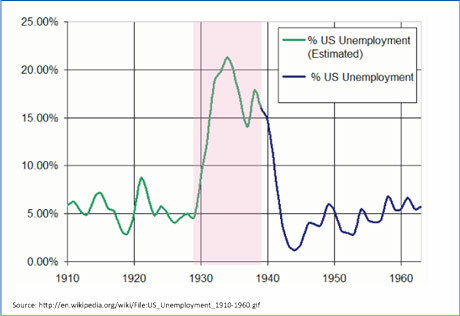 According to John Williams of Shadow Stats, if we were to calculate unemployment using the same metrics as we did during the 1930’s, or even the 1980’s, we’d already be in Great Depression territory. 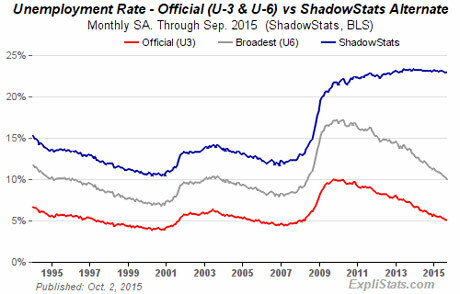 Williams, who utilizes a reporting methodology that accounts for “long-term discouraged workers who were defined out of official existence in 1994,” notes that the real unemployment rate is rapidly approaching 25%. 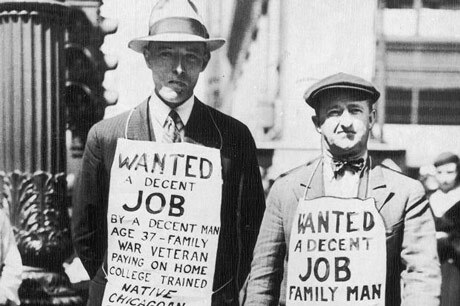 It’s so bad, in fact, that we have seen sustained unemployment exceeding that of the Great Depression for almost the entirety of Barack Obama’s Presidency. But how can it be possible to have a full-fledged recovery and record stock prices when nearly one-third of the adult population is not working? 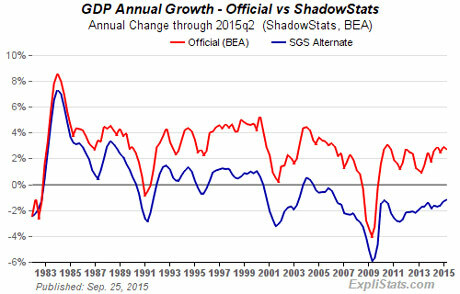 If the government is to be believed, it’s because our economy continues to grow at a pace of about 2%. But once again, if we calculate the real growth rate and adjust for inflation, we see exactly why jobs are non-existent and getting worse every month. We’ve already witnessed numerous shocks to the global economy over recent weeks and the prospects of any sort of stability just went out the window. There is no recovery. There are no jobs. There is no growth. The United States, regardless of what is being said by mainstream financial pundits or believed by their TV-watching myrmidons, is now (and has been for quite some time) in a recession. What’s worse is that most have no clue of how bad things really are or that they are witnessing America’s Second Great Depression. We have seen many prognostications of what might happen in the Fall of 2015 and beyond. For now, we have avoided the Doomsday event many have feared. So the world didn’t end, but we should face the facts that our world is exponentially changing. In the last ten years, it has changed so dramatically that many of us do not recognize it. Riots, extreme climate changes, epidemics, unemployment, political upheaval, I could go on, but I think you get the picture. These changes are the events you should prepare for. Preparing for a singular event is impractical and will leave you exposed and with gaps in your preparedness plan. That said, if your preps were well-rounded enough, you can insulate yourself from many different forms of disasters: natural, personal, economic, societal, etc. Once you are prepared for a multitude of events, you don’t worry as much. There are always events that are out of our control. The only control we have is to be ready for them the best we can by being prepared, self-reliant, not depending on the system, and changing our perception about disasters. The collapse that many have suggested will take place at some point in the future is actually happening right here and now. If the charts above are accurate – and we believe they are – then America is already in the throes of its next Great Depression. TLB recommends you visit SHTF plan for more pertinent articles and information.